Confession: I have a horrible, horrible habit of leaving balls of yarn around my house. On the couch, on the chair, on my other chair, on the table… It’s a mess. My permanent yarn storage space is still under construction. Mr. M. has been busy constructing some built-in bookcases (or yarn cases!) on either side of our fireplace. One half of the project is built and installed (minus the trim); the other half is still out in the shop. 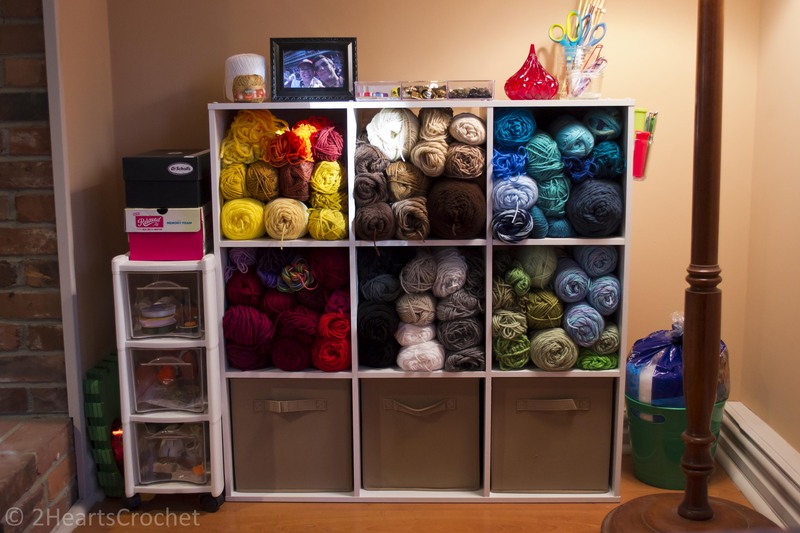 The built-in “yarn case” has taken over this unit’s home (leaving this storage unit with no place to go but the center of my living room). 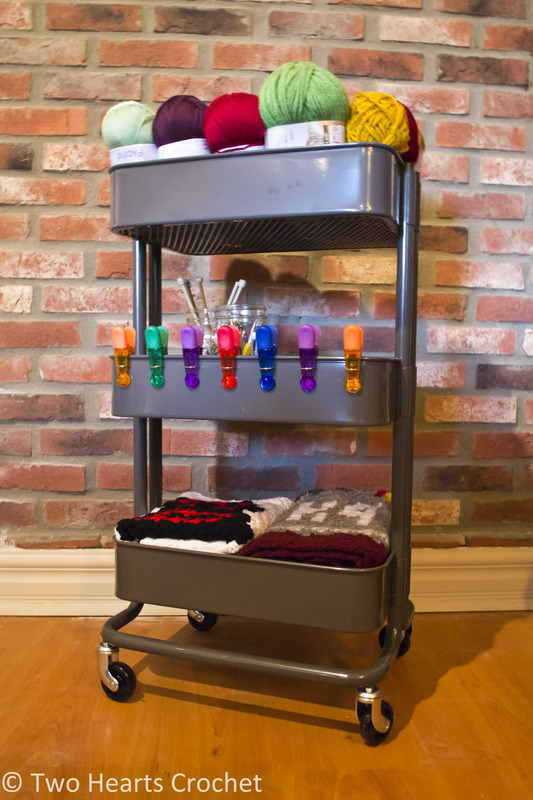 Enter: the Ikea Raskog Utility Cart. This cart is wonderful. It’s 3-tiered and comes with plastic casters to roll around on (we plan to replace those with rubber ones from the hardware store to help protect our floors). 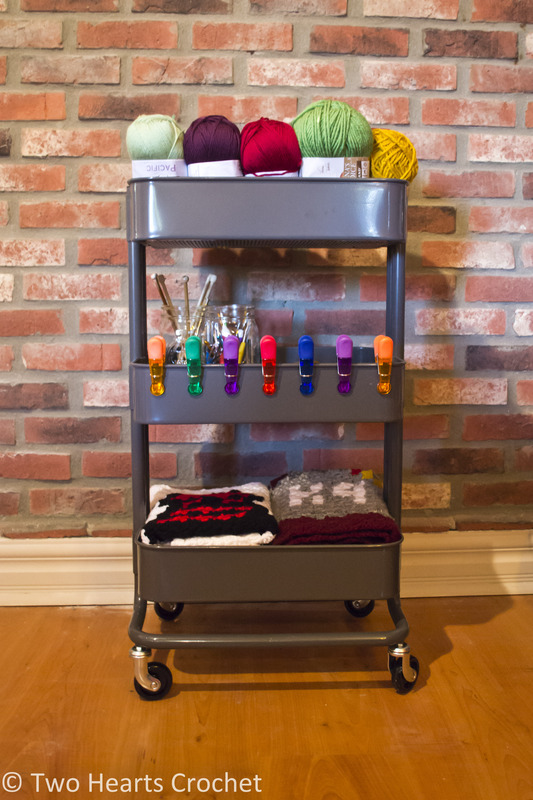 I purchased this cart from Ikea for $29.99 (plus $10.00 in shipping). It comes in three different colors: dark gray (pictured above), turquoise and beige. If you aren’t close to an Ikea or don’t want to wait for it to come in the mail, you can purchase one at Target for $35.99 (free shipping), though I’ve only found it in gray. The bottom shelf is perfect for holding the finished squares of the Whovian CAL (and they look so pretty there). The middle shelf (bonus: it’s adjustable!) holds my crochet hooks, knitting needles, and other miscellaneous supplies such as safety eyes, stitch markers and row counters. 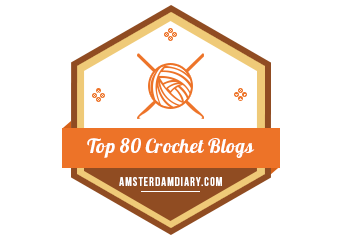 And the top shelf currently holds my go-to yarns! I can grab a skein of whichever yarn I need without having to go rummage through the pile of yarn on the chair… That’s improvement, right? I’m also planning to work up some kind of bobbin holder to attach to the back side of the cart for working with color changes on graphghans. I’m envisioning something that hangs off the back, but Mr. M. is much better at coming up with solutions to unique problems such as bobbin entanglement. I’ll share when we’ve figured something out! Hope you have an extra-crafty weekend! Did you have any luck replacing those casters with soft rubber ones? What stem size did you use? I am having a hard time figuring out exactly which thread to use for mine. Hi Jessica! I completely forgot to replace those casters with rubber ones. That being said, the plastic ones have done no damage to our floors, and they’re holding up well all this time later!